Do You Want to Work in Baseball? Bill Geivett was a frequent visitor to Tulsa during the Drillers’ 12-season affiliation with the Colorado Rockies from 2003-14. Geivett, in various roles from farm director to assistant general manager, kept close tabs on the Rockies’ prospects in Tulsa. After resigning from the Rockies’ front office in October 2014, he began writing a book, “Do You Want to Work in Baseball? Inside Baseball Operations,” that was released during the winter. Anyone who wants to break into baseball would be helped by reading the book. But starting with an attention-grabbing opening anecdote involving his friend Tommy Lasorda, the book is also interesting and informative in so many areas for all fans even if they have no interest in working in baseball. There are many entertaining stories and it takes fans behind the scenes that really haven’t been explored before in a book, such as Geivett’s unsuccessful interview to become Houston Astros general manager. 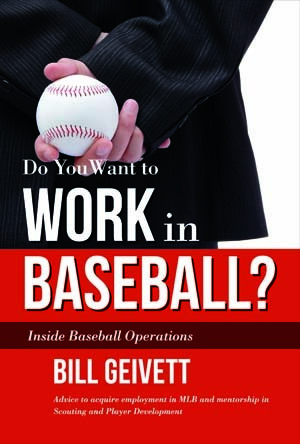 The first seven chapters are primarily focused on how to get a job in baseball and what it’s like when you get that job. Four chapters are devoted to scouting and the final seven before the conclusion are on player development and how to build a championship team. The book will help fans understand better why some decisions are made by teams, regarding personnel in general and during minor league games where strategy can be much different than in the majors due to player development considerations, such as why a pinch-hitter isn’t used in what would appear to be an obvious pinch-hitting situation. Geivett, 53, broke into pro baseball as a player in the California Angels organization from 1985-88 and played against the Drillers. He was a scout for the New York Yankees and also worked for the Montreal Expos, Tampa Bay and Los Angeles Dodgers before joining the Rockies in 2000. He lives in Arizona and is a baseball and business consultant. The website, www.insidebaseballoperations.com, has information on how to purchase the book. Why did you include your Astros interview? And you also learned from that Astros meeting never to wear cuff links to a job interview? You gave Alex Rodriguez an OFP (Offensive Future Potential) score of 64 in a scouting report (included in the book) that you filed for the Yankees when he was 17 and still in high school in 1993. What can we learn from that report? Who are some of the prospects that were with the Drillers who really stood out and you knew were going to be really good in the majors? Who was the most pleasant surprise among those who played with the Drillers? Q: Are you surprised that (former Oral Roberts and Drillers infielder) Doug Bernier is still playing in his 16th pro season after you signed him as an undrafted free agent in 2002? Do you have a favorite memory from your trips to Tulsa? Q: Was the Rockies’ pennant in 2007 the highlight of your career?